Continuing my habit of making surprise costumes for friends, I bought the fabric for this elven gown a month after I got married in 2014. It was listed as “Twilight Navy Crinkle Velvet” a name that can’t get more elven. I bought seven yards of it at a very reasonable price. 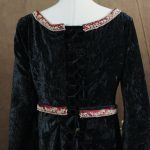 I am not a huge fan of the crinkled/panne velvet look, but the fabric was a step up from the usual offerings at the local fabric store and had a good drape. 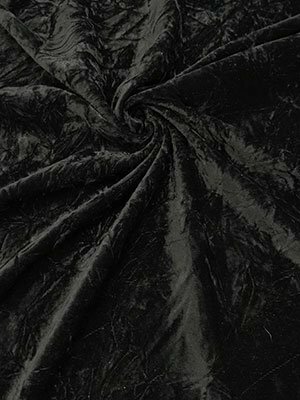 I also bought enough lightweight black polyester faille to line it with, before coming to my sense and realizing the extra layer would add too much weight and make the gown much too warm. 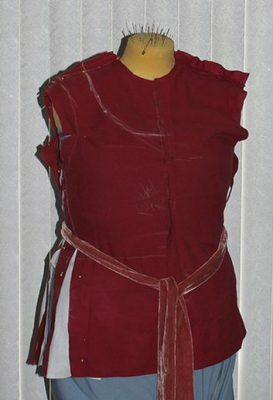 So I had my fabrics, I had my unsuspecting friend’s measurements, and I knew I was going to make her an elven gown. But what should it look like? 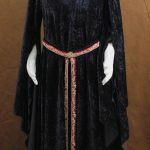 What sleeves should I make, should it have extra fluff on the sleeves? What trim? Buttons, no buttons? Should it have a train? 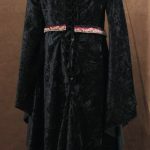 Arwen’s Mourning Gown won out in the end as my inspiration piece, which meant I needed some trim! 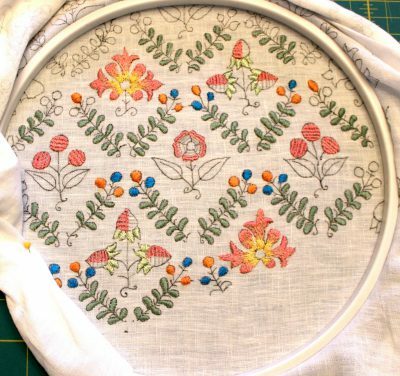 The original trim looks like zardozi cutwork mounted onto silk and then embroidered and beaded over. 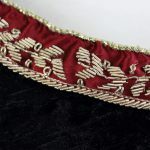 Maggie over at Costumer’s Guide has a great write up from when she made her trim. 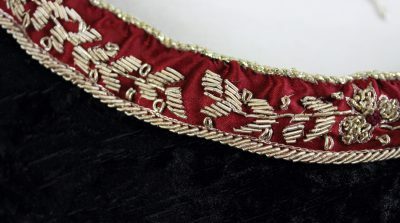 I was not wanting to make my own trim for this project so I headed to eBay and wasted lots of time looking at the pretties hunted for the perfect sari trim. And it seems I forgot to take a better photo of it! One of my favorite eBay sellers had the right type of trim at the right price. I ordered 3 yards and in the meantime got to work on the gown. I used the mockup from her kirtle as a base and made some adjustments. 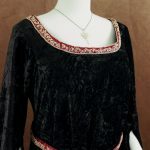 I scooped out the neckline, slashed over the hip to give the skirt a nice drape and chalked it onto the velvet. 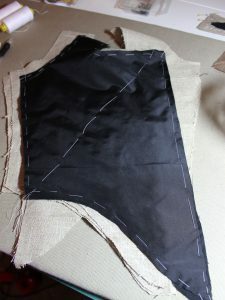 To keep myself from mixing up the velvet sections I marked an arrow on the back of each section to indicate the nap direction and then I cut several gores to widen the skirt. 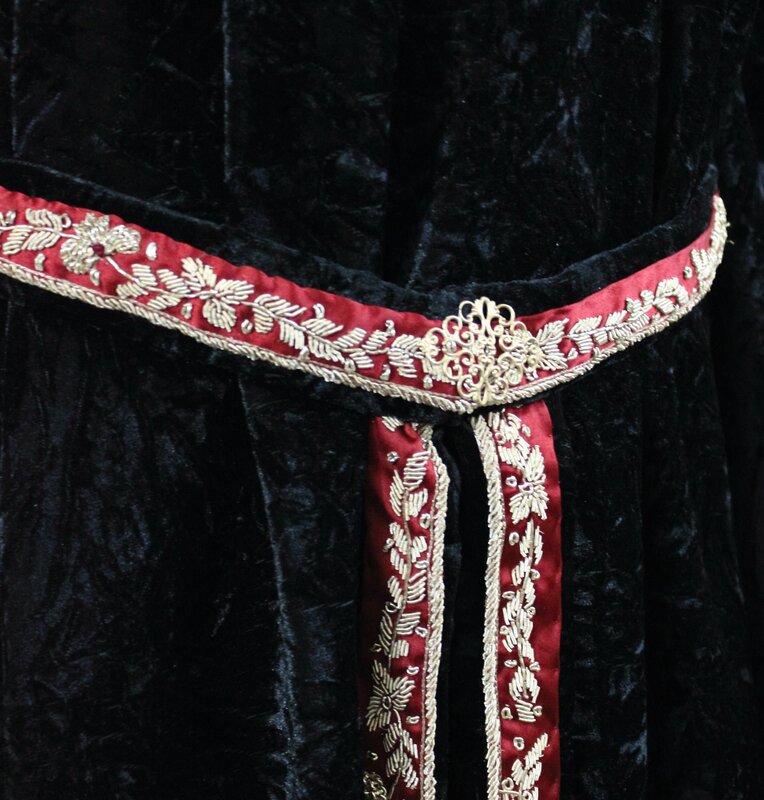 Then perhaps under the influence of velvet fluff, I cut a gored train to extend into the back of the skirt seam. 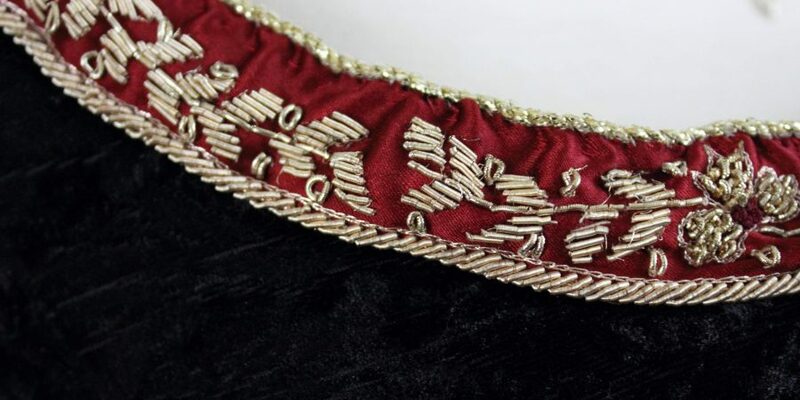 Cut, pin, sew with a walking foot, overlock and wrestle the velvet into position. I adjusted the design a little as I went. The neckline shifted a little, I cut off the train (bad idea if this was going to be worn outside). I entertained and abandoned the idea of sheer inner sleeves. 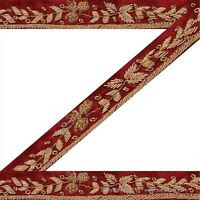 The trim arrived from India! It was beautiful, the purl was a soft gold…it was sewn onto a ground of crimson silk satin. 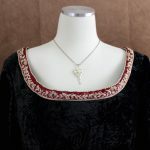 Silk satin is temperamental likes to wiggle and show every little flaw, and I needed to convince it to go from a straight band into a semi-curved shape of a neckline and I needed to piece it, since the trim was not all one length. I tried tiny tiny rows of gathering. I tried basting it on by hand and easing it a little at a time. In the end, I sewed the trim on (by hand!) and took it off at least 3 times until I gave in and let the silk satin win. It was on the neckline and it wasn’t going to come off again. 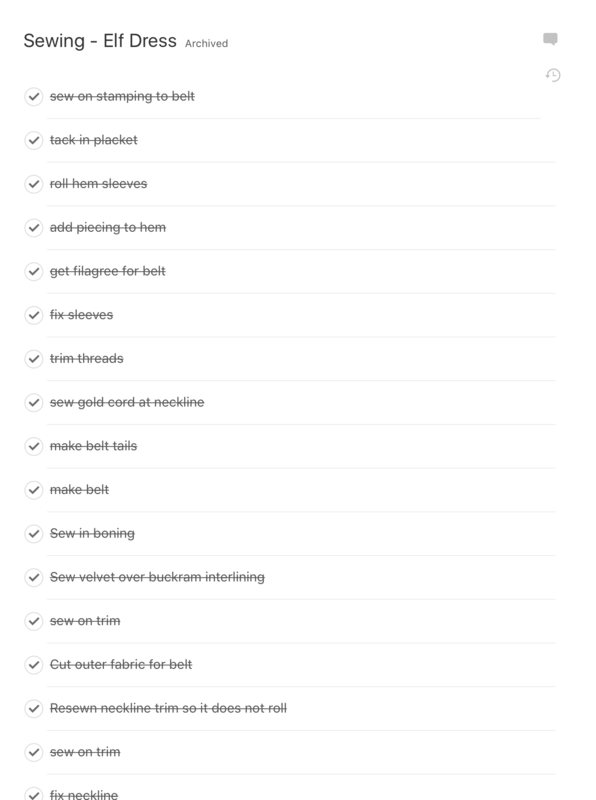 I finished the neckline edge off with a soft gold cord, realized I was nitpicking way too much and called it good. If I was faced with this situation again I would unpick the purl embroidery, dart the trim to fit the neckline, and sew the purl back on. 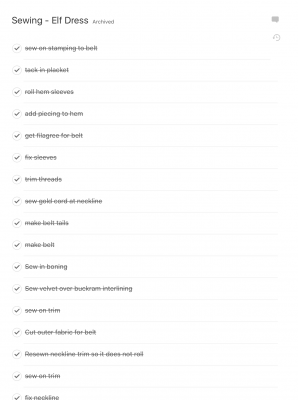 I did not do this because I had a limited amount of trim and purl to work with. Traumatized by the trim I approached the belt with a little more planning. The metal embroidery and goldwork gave the trim some weight. The belt needed to not stretch out but it also needed to lay correctly when on and not get in the way or catch on things. 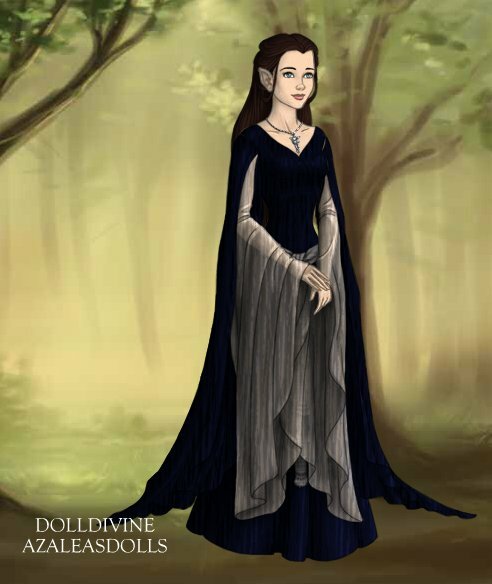 I turned to Starlightmasque’s Galadriel gown for ideas. I used lightweight buckram from Joanns, folded in half and then covered it in tubes of velvet. That was pressed and then basted and I hand sewed the trim down. I adjusted the front curve of the belt while it was on the dress form and covered the seam with a brass filigree stamping. Threads were clipped. 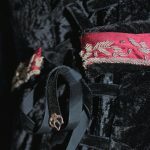 I finished sewing on what was close to 30 tiny loops made from velvet ribbon, the facings were tacked down, plackets in place. It was ready to go West. 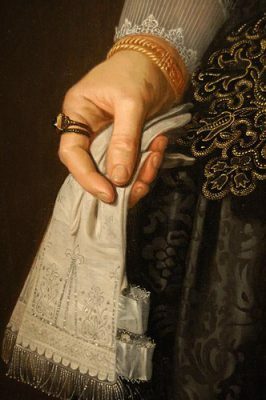 But I needed something to put the belt in, the dress did not have pockets. My friend would need a place to put her phone and other accoutrements. 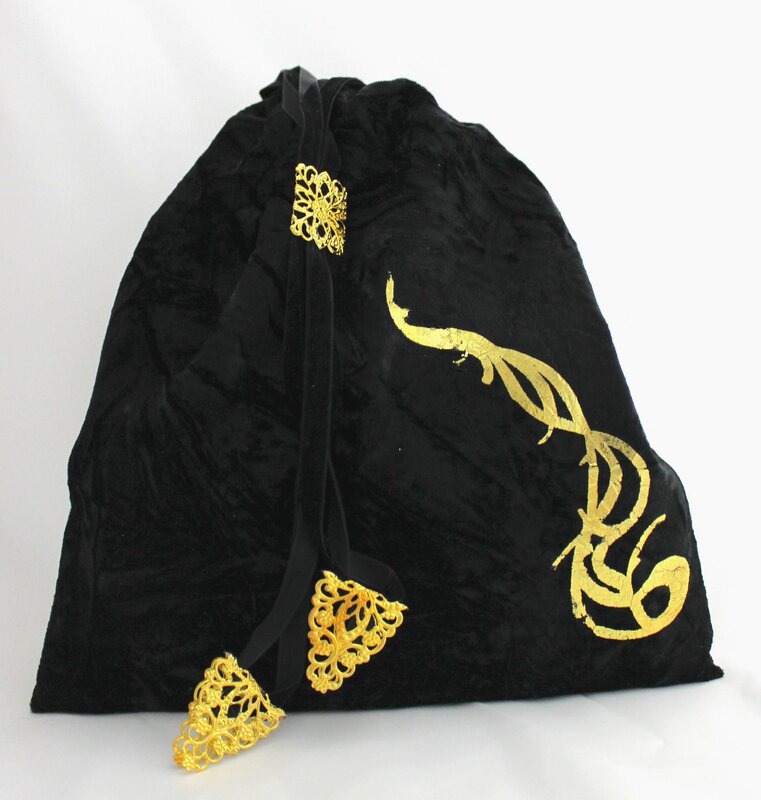 Around 11 pm I thought, I’ll make her a bag from some of the scrap velvet and ribbon. It went together fast but it looked rather plain. Maybe I could gold leaf/foil velvet? I had some leftover supplies from another project. I did some tests on scrap fabric. The glue in the kit was not working, it didn’t have enough sticking power or it just sunk down into the nap. It is now around 1am. 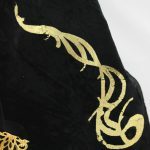 Can I gold leaf/foil velvet with double-sided fusible webbing? Yes. Some careful cutting and distressing later I had a very cute elven inspired bag. Never mind it was around 2am.